Enables seamless integration between smartphone and microcontroller. 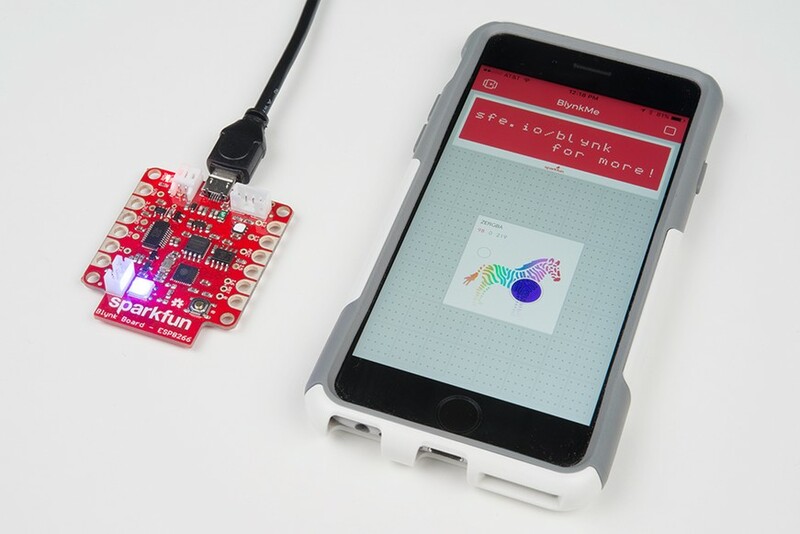 Boulder, Colorado – SparkFun® Electronics, provider of electronics parts and educational tutorials, and Blynk®, a platform to connect hardware to a smartphone, today announced the release of the SparkFun Blynk Board—ESP8266 with access to the Blynk app and the Internet of Things (IoT) Starter Kit with the Blynk Board, which empowers users to build multiple projects without any additional parts. The IoT Starter Kit provides the Blynk Board plus a diverse set of components—including a magnetic door switch, soil sensor, miniature photocell, servo, and linear slider—to build an array of web- and phone-connected projects. "We are committed to removing technical barriers and steep learning curves to enable makers of all skill levels to build innovative projects using their smartphones and a microcontroller," said Blynk founder Pavel Bayborodin. "By combining our technology with SparkFun's renowned hardware and support, we were able to develop a monumental tool." "The success of the Internet of Things has resulted in tremendous growth and opportunity in the area of web-connected hardware," said Nathan Seidle, founder and CEO of SparkFun. "The release of the Blynk Board and the IoT Starter Kit marks a major step in this movement, and it will help drive innovation by lowering the barrier of entry, giving more people the ability to solve problems with technology." To learn more about the SparkFun Blynk Board - ESP8266 visit www.sparkfun.com/blynk. To learn more about the Blynk app visit www.blynk.cc. Founded in 2003, SparkFun shares its passion by providing parts, knowledge, and innovation for those looking to explore the world of embedded electronics. It helps anyone discover their inner inventor and enables individuals to create their own electronics projects. SparkFun currently offers more than 2,100 products, ranging from simple components, like capacitors and resistors, to GPS units, Bluetooth modules, and comprehensive inventor kits; additionally, SparkFun has developed nearly 400 tutorials to inspire and support others in their exploration of electronics. After running a successful Kickstarter campaign, reaching 500% of the goal and gaining support from thousands of backers, Blynk launched its platform for makers in May 2015. Since then it has become a hugely popular software tool for makers, inventors, designers, teachers, and hackers who build and experiment with connected projects and products using microcontrollers and microcomputers. Blynk has made it easy for anyone who just started tinkering with electronics to snap together an amazing mobile interface, get the hardware online and enjoy seeing first results in just minutes.